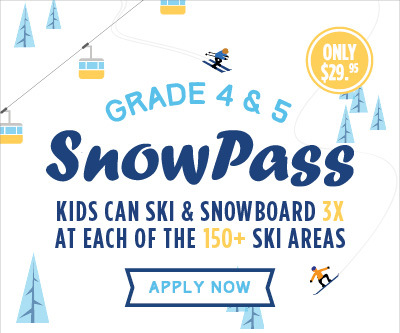 The SnowPass lets your child ski or ride 3 times at EACH participating ski area for only $29.95! Are you planning to ski or ride with your family this winter? The Canadian Ski Council’s (CSC) SnowPassRT lets kids ages 9 and 10 ski or ride 3 times at EACH participating ski area for only $29.95. That’s a lot of skiing and snowboarding all across Canada! The SnowPass Program is ideal to discover Québec and Canada’s participating ski areas. To view the list of participating ski areas in Québec, click here. The SnowPass Program is an initiative by the Canadian Ski Council. It aims to get kids moving every day, all year long. So a Grade 4 & 5 SnowPass is an excellent way to start winter!